NEW YORK CITY, May 11, 2016 – The sixth annual international Campagnolo GFNY Championship NYC is slated for this Sunday, May 15, 2016. The world’s most international cycling event brings riders from 86 countries to the world’s capital. It’s the culmination of GFNY World races around the globe, held in Argentina, Colombia, Cozumel-Mexico, France, Germany, Indonesia, Italy, Mexico City and Uruguay. Further races will be added in 2017. Athletes will take on a challenging 100-mile route with 8,500 feet of climbing from NYC to Bear Mountain and back. It sets the scene for 5,000 stories to be carried around the world. GFNY is a race as much as a personal endurance challenge. The race draws a spectrum of elite racers, celebrities and enthusiasts including CEOs, firefighters, teachers, persons with disabilities and many others passionate about the sport and the experience of riding the challenging and scenic course. NFL superstars Amani Toomer and Tony Richardson plan to settle the “New York Giants vs New York Jets” rivalry on the bike. Olympians Stacey Cook (Alpine Skiing), Nelson Vails (Track Cycling) and Alex Deibold (Snowboard) will test their mettle on a different turf. On Sunday May 15, riders will begin on the New York City side of the iconic George Washington Bridge at 7 a.m. and wind through the course in New Jersey and New York State that extends up at New York’s Bear Mountain State Park, with the finish line in Fort Lee, NJ. 15% of the field partakes in the 50-mile GFNY BEAR on the same day, a non-competitive ride starting at the George Washington Bridge and finishing on Bear Mountain. Many of these riders use GFNY BEAR as a stepping-stone towards completing the 100-mile GFNY in the future. The course highlight is the scenic and rigorous Bear Mountain. Riders will get a boost from cheering spectators in the Rockland County and Bergen County towns that the course travels through. The event draws enthusiastic supporters along the route, especially with many GFNY cyclists fundraising for local charities. Podium finishers overall as well as in all age groups and team categories will take home prizes. The overall winners receive a GFNY De Rosa bike with Campagnolo components valued at $13,000. Since 2012, GFNY hires the United States Anti Doping Agency (USADA) to administer in- and out of competition doping controls that ensure a fair competition. GFNY was the first amateur event to hold out of competition controls (=not on race day). These controls are critical to serve the surprise element. GFNY CEO Fluhme is also a Board Member of the newly-founded Anti-doping Panel of the USA Cycling Federation. Like last year, GFNY will also do checks for motors on bikes at the start and finish. In addition to the race, the sixth annual NYC Bike Expo will take place on May 13-14 from 11am-6pm at 69th Regiment Armory in Midtown Manhattan at 26th Street and Lexington Avenue. GFNY World events, race sponsors and other vendors will be on hand to showcase their latest offerings. The expo is a stand-alone event organized by GFNY that is open to the public and draws nearly 15,000 visitors. 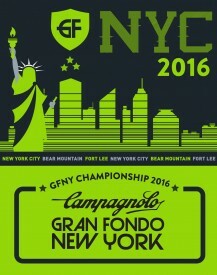 The 6th annual Campagnolo GFNY Championship New York is held on May 15, 2016. The race features the world’s most international peloton with riders from 86 countries. Athletes take on a challenging 100-mile route from NYC to Bear Mountain to Fort Lee to compete against each other, the clock and themselves in a personal endurance challenge.